Cat equipment gives you the ability to construct access and hauling roads into forestry work areas. As the leading manufacturer of construction equipment, Caterpillar has a wide variety of road building machinery to meet your forestry road building and maintenance requirements. All Caterpillar Forest Machines are available in General Forestry arrangements with excavator linkages for road building. Purpose-built undercarriage and structural components provide maximum value for road construction in the most rugged terrain. Track-Type Tractors offer a wide variety of models and configurations, making them one of the most versatile and productive forestry machines. 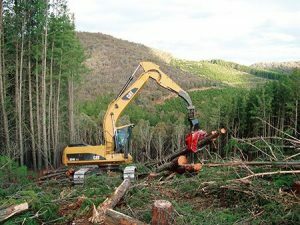 Excavators have outstanding versatility and productivity when matched with the right forestry work tool. One of the most versatile machines in the Cat product line, Motor Graders give you the ability to construct and maintain forestry access and hauling roads.